The Lifesize Skeleton Anatomical Model is an affordable and excellent reference model. 180cm high with a solid base, showing all anatomical bones, the model is designed as a visual aid to teach physiology and hygiene courses. The Skeleton Model helps students to understand the relationship between the human body figure and the skeleton. 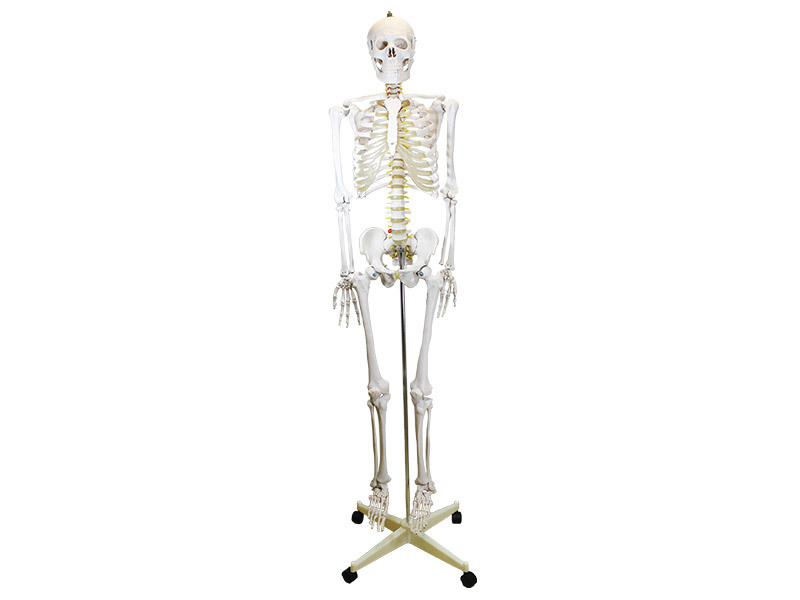 The Lifesize Skeleton Model is ideal for use when studying the morphology of bones and construction of joints. Height 180cm when fully assembled on the stand. The joints of the upper and lower extremities are movable. Composed of 22 pieces of bone with serrated sutures lines are marked out. Calvarium is transversely cut to show the interior structures of the skull. The mandible is movable. Includes 7 cervical vertebrae, 12 thoracic vertebrae and 5 lumbar verterbrae, sacrum, coccyx and 23 intervertebral discs. The vertebral column shows four curvatures, i.e. cervical and lumbar curvatures, being convex forward, thoracic and sacral curvature, being convex backward. 24 ribs, costal cartilages and sternum. Includes 7 pairs (1-7) of true ribs, 3 pairs (8-10) of false ribs and 2 pairs (11-12) of floating ribs. Composed of sacrum, coccyx and pelvic girdle. Features 64 pieces of separable bones. The pectoral girdle (scapula and clavicle) are fixed on the bony thorax, the remaining parts of the upper extremities can be removed. The main joints (shoulder, elbow and wrist) are movable. Includes 62 pieces of separable bones. The pelvic girdle (hip bone) is fixed to construct the bony pelvis. The remaining parts of the lower extremities can be removed. The main joints (hip and knee) are movable. Excellent detail and great quality for the price. Really helped me in my finals as a revision aid. Will be a great partner for my new clinic..